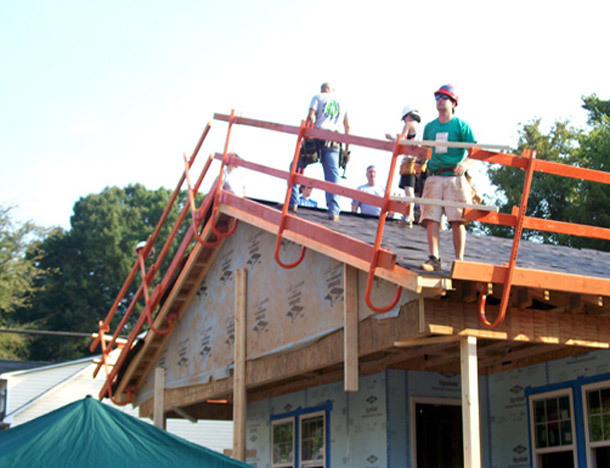 Organizations like Habitat for Humanity use volunteer labor for residential roofing projects. The use of volunteer labor can be quite a dilema when it comes to keeping everyone on the worksite safe from injury. One of the most dangerous areas of a volunteer work site is a roof. 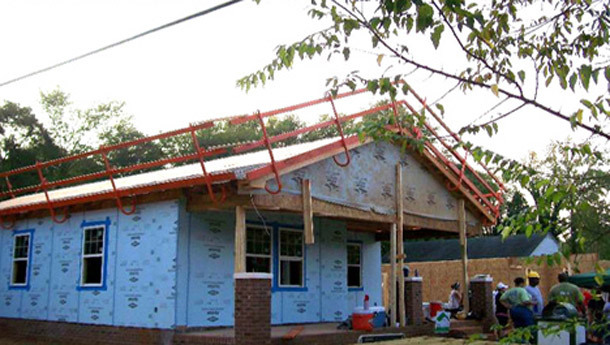 An innovation in guardrail technology from HUGS now makes residential roof work much safer and more efficient. The HUGS guardrail system allows the project manager to setup a safe working perimeter on a residential or commercial truss based roof. This solution is ideal for volunteer organizations who want to provide a safe working environment for volunteers working on the roof. Instead of requiring skills training and fall arrest equipment, the HUGS guardrail perimeter can be erected easily and for low cost, proving the safest possible work environment. We have used the HUGS for about three years at my Habitat Affiliate - I think our original cost was near $2000. They have been used about 15 times, so we are approaching $100 per house; Cheap! No work on a roof without the HUGS system installed, period. No exceptions for new construction. Dave's quote points to the value that HUGS can bring: excellent roof top safety for volunteers at a reasonable cost.